A few years ago, I made a quick video of explaining the best weight room exercises for Sprinters and Jumpers. I don’t reveal the best 5 exercises until 2 minutes into the video. Why? Because answering that question is like answering “How long is a piece of string?”. 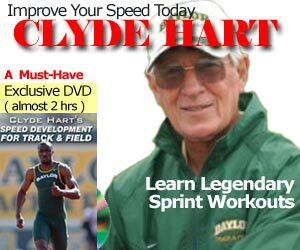 There are so many variables in determining the best 5 exercises for sprinters, but it’s in the video, so I won’t repeat myself. I was given an East German workout of the “2 plus 1” system by Bob McCrindle back in1987. At the time, he was studying Physical Education at McGill, and today he is a Counsellor and Consultant specializing in ADHD and Concussion Management. This “2 plus 1” system specifies 2 primary exercises, and 1 ancillary exercise. 13 years later when I met Charlie Francis, he also emphasized this “2 plus 1” system. (Gee, I wonder where he got that from?) The weight room workout should not be more than 45 min after a track workout. If you are in the weight room more than 45 minutes, you are probably doing endurance training for your tongue and jaw muscles. If you’re in the Weight Room more than 45 min, you’re probably training your tongue muscles. Now we got that out of the way, let’s talk about Glute Ham Raises. Readers are probably tired of me doing my own demonstrations, like my Achilles Strengthening video, so what better way to demo this than to have Darya Klishina performing the Glute Ham Raises. For beginners, you can use a machine at the gym by using your thighs as the fulcrum, which makes it easier. Once you are advanced, you can have someone hold your ankles, which makes this exercise much more difficult. Give it a try, report back on findings, and add it to your weight program for Sprinters or Jumpers.